Leyton Orient had to settle for a draw as they played out a nil nil scoreline at Brisbane Road against local team Boreham Wood. In a fairly dull encounter neither team could find the back of the net as the 4,094 who had braved the January cold were dealt with crumbs to feed on in a pretty lifeless match. Chester City excellent 1-0 turnaround over at Ebbsfleet means the gap between Chester down in 21st (the last of the relegation places) and Leyton Orient in 19th is down to 7 points. Barrow sandwiched between the east Londoners and the team from Cheshire also picked up a point in their 1-1 draw with Tranmere Rovers. If the match lacked entertainment then on the plus side for O’s manager Justin Edinburgh was the fact that Orient had collected two successive clean sheets although this was also the second 0-0 on the bounce. 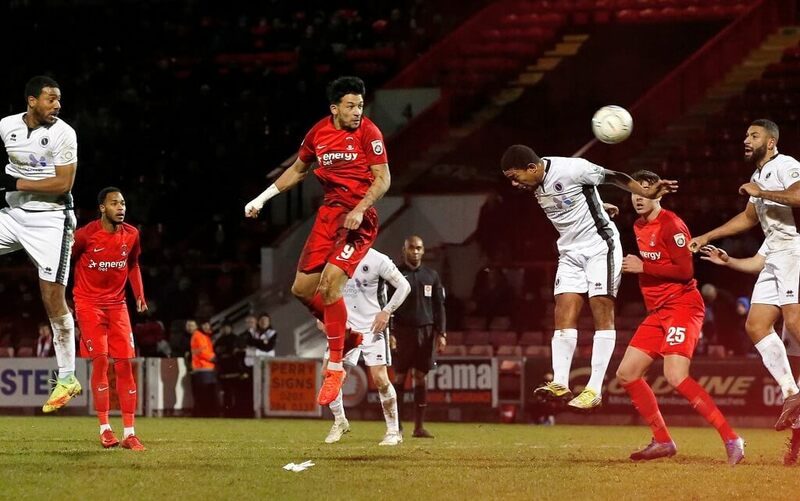 Orient thought they had nicked all three points when Leyton Orient forward Macauley Bonne had the ball in the net in the 82nd minute but it was disallowed as the referee brought play back for a foul on Boreham Wood goalkeeper Grant Smith. It was a moment of controversy on an otherwise uncontroversial afternoon. It would have been the clincher in a match with little incident. It’s not all doom and gloom though as the O’s back four are holding ship and they look steady. After all while Rome wasn’t built in a day Leyton Orient football club won’t be rebuilt in six months. Edinburgh’s festival of revolution requires time and the pieces are slotting in one by one so although many home supporters would have felt it more worthwhile at the January sales the same could be said for the Orient team in the transfer window in order to consolidate and just stay in the National League. The O’s had a few efforts in truth but they were unable to convert their chances against a Boreham Wood team dropping anchors all over the park in an attempt to subdue the home team and it worked to plan for the Hertfordshire club. 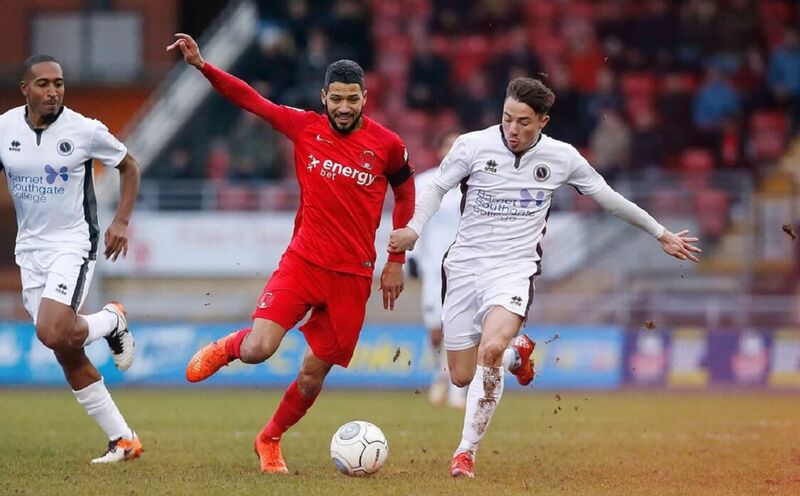 For Orient, there were two new loan signings Lamar Reynolds and Dan Holman among the substitutes and David Mooney having a tough season also dropped to the bench as Jobi McAnuff having recovered from his recent knee injury started while Matt Harrold came in to partner Macauley Bonne up front. The visitors started brightly as Bruno Andrade took a quick free to Angelo Balanta after the O’s were sleeping and the ex-Queens Park Rangers attacker picked out defender Alex Davey inside the area, but Orient goalkeeper Dean Brill saved superbly from close range. Orient came back strong though as Alex Lawless tested Grant Smith in the Boreham Wood goal in the eighth minute with a low drive. It would have stung his hands on this biting cold and horrid afternoon for playing, let alone watching football. Wood started to get on top as the first half wore on and almost broke the deadlock when the fabulous Andrade nipped in ahead of Happe and skilfully got past the teenager before cutting back to Angelo Balanta, yet he fired against the crossbar and over from 10-yards. Smith between the Herts teams sticks then produced a smart save to deny Orient’s David Mooney four minutes later as the first half finished scoreless despite Andrade heading over five minutes before the break following a Kane Smith cross to stop the visitors going in ahead at the break. Orient came out stronger in the second half but were initially unable to make too many waves however a decent chance occurred in the 68th minute when Bonne flicked the ball on and Grant Smith came to collect, but his own defender Tom Champion tried to clear causing confusion in the Boreham Wood area and as the ball spun out for James Dayton around 25 yards out with the goal gaping he drilled well over under pressure from Champion. With 8 minutes remaining Orient thought they had won it when Grant Smith took too much time on the ball and Mooney closed him down well and the Wood goalkeeper slipped, which gifted Bonne the ball and he tapped home. However the referee adjudged Mooney to have fouled the keeper.